An incorrect bite can cause damage to teeth, gums, and bone in the jaw, cause intermittent or chronic pain, and make it difficult to speak, eat or smile with confidence. Drs. Craddock and Godat, our experienced Memphis periodontists, can help provide solutions for a misaligned bite and restore proper form and functionality to your smile. Occlusion is the relationship between your upper and lower arches of teeth. Your bite should be even with teeth aligned in such a way that no tooth bears undue pressure. A misaligned bite, or improper occlusion, can cause multiple problems including temporomandibular joint disorder, also known as TMJ or TMD. Aligning a bite, called occlusion, is important when a tooth bears undue pressure when the upper and lower teeth meet to prevent damage to teeth, gums, and underlying bone. Bite therapy can gently and efficiently realign the way your upper and lower arches and individual teeth within each arch interact with each other. When proper occlusion is achieved, many patients who have suffered for years with headaches, jaw, neck and shoulder pain report their issues lessen significantly or disappear altogether. In addition, realigning a bite can help prevent damage to the teeth, gums, and underlying bone. Grinding of teeth (also known as bruxism) and clenching of the jaw are two common types of bite habits which can cause damage to your teeth. Grinding your teeth can wear down your enamel and change the shape of your teeth. Clenching causes too much pressure to build up by squeezing the teeth, which can lead to an actual cracked or broken tooth. When Could My Bite Be Destructive? When teeth show wear, looseness, spacing (gaps between teeth), or shifting (called bite collapse), and/ or when damage/ pain occurs in TMJ (jaw joint) . The latter is also called TMJ Disorder (TMD). Laser Assisted New Attachment Procedure (LANAP) to treat periodontal disease, allowing the gums and bone to heal and regenerate, providing renewed support for teeth which have begun to loosen. Occlusal Adjustment to reshape the biting surfaces of the teeth, equalize the pressure of your bite across all surfaces of your teeth, and eliminate excessive pressure where the teeth make contact. Tooth Splinting to bond loose teeth together with an adhesive material that acts as a splint, preventing them from moving out of place and allowing the bone time to form a stronger grip on the tooth. Mouth Guards which are custom-fitted and adjustable and can be worn to keep the teeth from grinding or clenching during the day or at night. Orthodontics to shift and move teeth into the correct position for a strong healthy bite, correcting such issues as overbites, underbites, and bites that are misaligned from side to side. 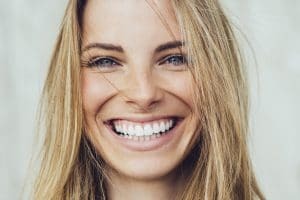 Full Mouth Reconstruction to replace worn or damaged crowns, fillings, and dental bridges which may be adversely affecting the bite. Dental implants and/or aesthetic crown lengthening may also be used to create a smile that is functional as well as beautiful. Bite Adjustment (Occlussal Adjustment) – This involves reshaping the biting surfaces of the teeth to eliminate spots of excessive pressure when the teeth are brought into contact. This will create even bite pressure on all your teeth. In turn, this puts even bite pressure on the bone and prevents over-stressing the bone. This aides in healing from periodontal treatment. Splinting Teeth Together – Teeth may be splinted together with tooth colored bonding material. This helps prevent mobile teeth from moving. This also aides in healing from periodontal treatment. Just like a cast aides healing after a broken bone, splinting prevents tooth movement and allows the bone to heal along the root. Bite Splint Therapy (Night Guard) – Using a custom-fitted and adjusted plastic bite guard to keep the teeth apart, night, day, or both helps take the stress off teeth, dental implants, jaw joint, tooth restorations (fillings, crowns, etc.) and bone. Braces (Orthodontics) – Braces re-position mal-aligned or drifted teeth. Periodontal treatment may be necessary prior to orthodontic treatment to obtain healthy and stable gum and bone tissue to support the teeth. Replacement of old, worn out, or damaged fillings, crowns, etc can help to correct the bite. Reconstruction of badly worn and damaged teeth with crowns and bridges may also help. This may involve a full mouth reconstruction (also called a smile makeover). Reconstruction of badly worn and damaged teeth may involve esthetic crown lengthening as well as dental implants. Contact us today for a consultation and find out if bite therapy could be right for you.